Research is actively encouraged and, where appropriate, small teams set up to investigate themes and areas which might lead to excavation and publication. 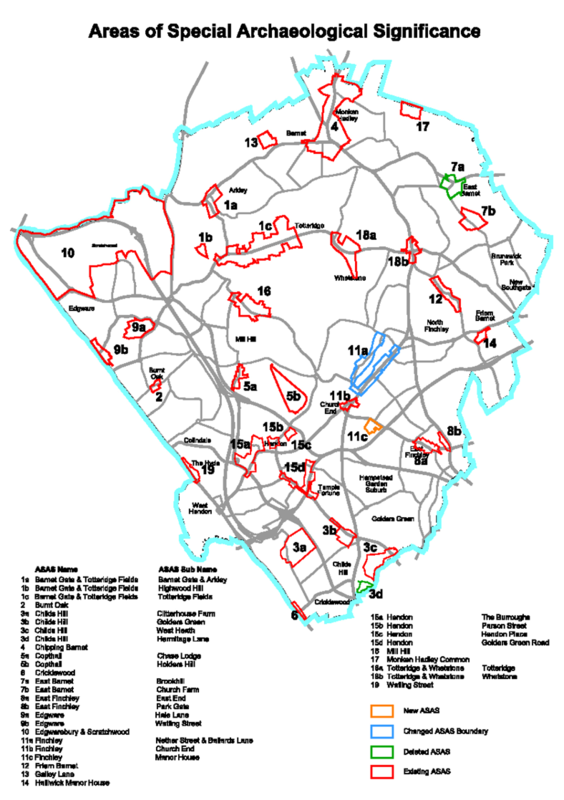 At the moment research is being undertaken on the 19 Archaeological Priorty Areas (APAs) in Barnet. Read more about this work below and if you are interested in joining in then please get in touch. Barnet has two key planning documents that deal with the Boroughs archaeology. It has the Local Plan Core Strategy and the more detailed Development Management Policies. Both these documents were approved by Council in 2012 following an examination in public, to which HADAS contributed. What do these documents say and how can we use them to further the interests of Archaeology in Barnet? Over the years many developers in Barnet have submitted desk top appraisals on sites prior to development and some field reports have been completed. Using these, along with site visits, historical research etc. we have established a HADAS Research Group meeting on Sunday mornings at Stephens House, with the intention of reviewing all 19 of the Boroughs “Local Areas of Special Archaeological Significance”. Partly this will be so that we can proactively identify sites where we know in advance that we will want detailed archaeological work to be undertaken but also to prepare ourselves for the update of Barnet’s planning policies which will begin in the next 18 months or so and to which we can put detailed evidence of existing areas and possibly also identify new ones for inclusion.